Consumers choose convenience above all else. Is it any wonder that consumers choose convenience as the defining factor not only of the collaborative economy, but of nearly any consumer experience? If your industry’s consumers are interacting with you using mobile devices, then you are at risk of disruption from one-touch companies that are more collaborative, more scalable, and more agile than you. Disruption from the collaborative economy almost always comes from mobility. Audience is at the top of the funnel, so a 5% decline in audience becomes a 5% decline in leads, and eventually a 5% decline in sales. What percentage of your audience could you afford to lose to a more agile, more scalable, more collaborative competitor? 5%? 10%? 25%? I would argue that your company would be at risk as a marketer and communicator if 10% of your sales vanished in a year. Depending on the company you work for, even flat sales could put your company at risk. 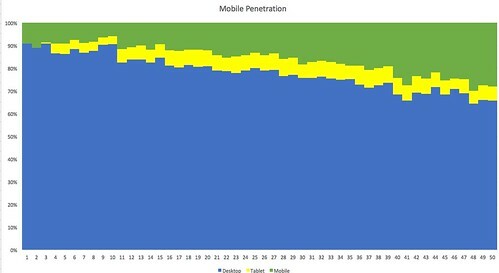 Based on that knowledge, make a similar chart as the one above and see how mobile your audience is now. 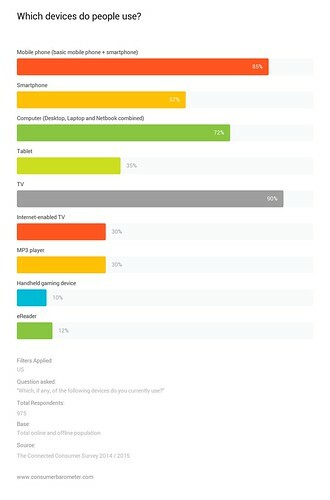 Fully 30% of my audience is mobile now. If I can’t afford to lose 30% of my audience, leads, and sales, then I’d better have a plan for disrupting myself before a competitor does. For some companies, disruption may come from simply switching vendors and distribution partners. For other companies, disruption may mean a complete product line revamp and new partners. Be sure to grab Jeremiah Owyang’s new report (free, registration required) to learn the three strategic ways you can disrupt your competitors before they disrupt you.